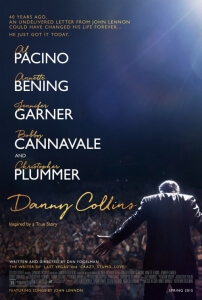 It’s fitting that redemption is a major theme in Danny Collins, because not only is it the goal that its titular character, played by Al Pacino, wishes to accomplish, but is also one that Pacino himself desperately needs. The actor who once chilled audiences with his roles in the Godfather trilogy, Scarface, Dog Day Afternoon and countless others has in recent years gone down the path of providing lacklustre and underwhelming projects like 88 Minutes, Righteous Kill and – most damningly of all – Adam Sandler’s notorious stinker Jack and Jill in which he – playing himself – is seen shamelessly licking Sandler’s sweat stain and having his one Oscar destroyed on-screen. By this point, Tropic Thunder’s rapper Alpa Chino has more on-screen dignity than the real thing. Redemption, thus, is fittingly on the cards for both actor and character, and Danny Collins is at the very least a confident step in the right direction. Pacino, here playing a Rod Stewart-style rock icon who gets his affairs in order upon receiving a belated handwritten note from John Lennon, is effortlessly charismatic here, never going as OTT as so many people are probably used to seeing him by this point and delivers a performance that’s genuinely heartfelt and good-natured which should certainly rank among his strongest in recent memory. The character itself is actually rather likable, and isn’t a grump or secluded douchebag like a lot of other characters in these type of movies but instead truly seems like a friendly guy; he remembers people’s names, he makes charming small-talk, and he’s an all-round interested guy. You really want to see this guy reach his goals, even when it can sometimes seem he’s doing things to satisfy his own ego; there’s a passion to what he’s feeling, and you have to admire someone like that. As great as the film makes out Collins, and thus Pacino, to be in this script, it’s never to a point where you see it as a cynical vanity project. Dan Fogelman, the writer of Tangled and Crazy Stupid Love making his directorial debut here from his own script, has based the character and scenario on a real-life singer who got a similar note from both Lennon and Yoko Ono, and it’s clear that Fogelman’s heart is in the right place as he sets out to discover the man who awed the former Beatle. The fictional Collins represents Fogelman’s romanticised vision of someone who must have done something right if he impressed John Lennon of all people, but just so happens to have lost his way with an endless supply of narcotics (which are toned down considerably here) and adoring supermodel lovers. Fogelman, in both his writing and direction here, gets his fascination across very smoothly in the final product, and though he can slip a little into cliché here and there it’s not for very long and it keeps its focus on exactly what should be focused on. Pacino is backed up by a talented supporting cast, including veterans like Christopher Plummer (as his weary but supportive manager) and Annette Bening (as the sensible manager of the Hilton hotel which Collins checks himself into) as well as newly-established character actors, with Bobby Cannavale in particular standing out as Collins’ estranged biological son who has his own arc that is very effectively portrayed. Even the typical “annoying kid” archetype isn’t that bad here, and they even provide a reason why said kid is annoying so it balances out fairly well. What makes the movie work especially well, however, is its focus on pure heart. As stated earlier, you genuinely feel for Collins in his struggle to put things right in his life, and you want to see him succeed in whatever way may be possible. Some will see the turns it makes later on in the film as a heavy dive into forced melodrama, but they are very subdued and acted wonderfully that it doesn’t matter; it’s effective and expertly done, while amazingly never ceasing to be entertaining. If Danny Collins is any indication, it’s likely we’ll be seeing Al Pacino’s own redemption story come sooner than we think. After all, it can’t be THAT hard to bounce back from licking Adam Sandler’s sweat stain, right? 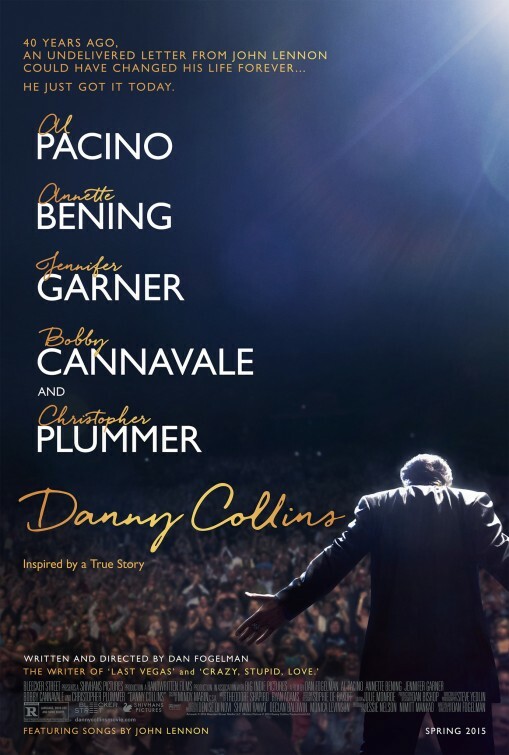 Danny Collins works with a great amount of heart and genuine charm, which is provided by a strong and emotional performance by Al Pacino as well as a talented supporting cast, with writer-director Dan Fogelman also giving us a heartfelt and extraordinarily likable tale of redemption to carefully balance it all out.